The capability of unmanned aerial vehicle (UAV) spectral imagery to assess maize yield under full and deficit irrigation is demonstrated by a Tetracam MiniMCA12 11 bands camera. The MiniMCA12 was used to image an experimental field of 19 maize hybrids. 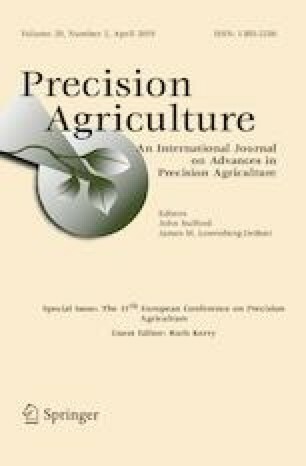 Yield prediction models were explored for different maize development stages, with the best model found using maize plant development stage reproductive 2 (R2) for both maize grain yield and ear weight (respective R2 values of 0.73 and 0.49, and root mean square error of validation (RMSEV) values of 2.07 and 3.41 metric tons per hectare using partial least squares regression (PLS-R) validation models). Models using vegetation indices for inputs rather than superspectral data showed similar R2 but higher RMSEV values, and produced best results for the R4 development stage. In addition to being able to predict yield, spectral models were able to distinguish between different development stages and irrigation treatments. These abilities potentially allow for yield prediction of maize plants whose development stage and water status are unknown. The online version of this article ( https://doi.org/10.1007/s11119-019-09659-5) contains supplementary material, which is available to authorized users. This research was supported by the Israeli Ministry of Agriculture and Rural Development (Eugene Kandel Knowledge Centers) as part of the Root of the Matter - The root zone knowledge center for leveraging modern agriculture (Contract No. 16-34-0005). The postdoctoral Pratt foundation partially supported Ittai Herrmann. The Townsend lab received support from USDA Hatch funding (Project WIS01874). The authors would like to thank: Alexander Goldberg for all his help in the field and much beyond; Offir Matsrafi for his long term and long distance GIS support; Michael Travis from the University of Wisconsin-Extension, Pepin County for sharing his knowhow regarding corn cultivation in the Midwest; Aditya Singh for his insights; Ben Spaier for his comments, questions and proofreading; Evogene Ltd.: agronomist Mor Manor and his team; phenotyping team, led by Raanan Ganor; sampling team, led by Sara Koretzki; data and imaging team, led by Yogev Montekyo; and R&D Researchers that helped and supported planning and management, especially Inbal Dangoor, Ronit Rimon Knopf and Alon Glick. Darby, H., & Lauer, J. (2006). Critical stages in the life of a corn plant. Retrieved July 8, 2017, from http://corn.agronomy.wisc.edu/Management/pdfs/CriticalStages.pdf. FAO (2016) ‘Crops world wide area harvested and production’ Fao. Retrieved April 27, 2018, from http://www.fao.org/faostat/en/#data/QC. Townsend, P. A., Green, R. O., Campbell, P. K., Cavender-Bares, J., Clark, M. L., Couture, J. J., et al. (2016). Global terrestrial ecosystem functioning and biogeochemical processes. Retrieved April 04, 2017, from https://hyspiri.jpl.nasa.gov/downloads/RFI2_HyspIRI_related_160517/RFI2_final_Ecosystem_TownsendPhilipA.pdf. Wise, B. M., Gallagher, N. B., Bro, R., Shaver, J. M., Winding, W., & Koch, R. S. (2006) ‘PLS_Toolbox Version 4.0 ‘ for use with MATLAB. May 18, 2015. Wenatchee, WA, USA: Eigenvector Research, Inc., p. 414. Retrieved from http://212.51.214.51/jsurmacki/pliki/zajecia/LMDiT/cw3/PLS_Manual_4.pdf.